97% of new visitors do not convert the first time they arrive at your site. Can you afford not to have a remarketing strategy? This Wednesday, 4th May, we'll be hosting a live, online course on Remarketing as part of the AdWords Online Classroom (UK). This free, interactive presentation will be delivered by an Online Media Specialist and will take place at 3 pm BST (GMT +1), lasting for approximately one hour and including time for Q&A. Remarketing is a simple way to connect with your website visitors. After driving traffic to your site with search ads, you can then remarket to those people who reach your site by showing them tailored ads as they browse sites on the Google Display Network. This live course will take you through a step-by-step guide to remarketing campaigns. It'll cover how remarketing works, the best strategies to choose, and also campaign setup and optimization. This course is suitable for advertisers who are already running campaigns on the Google Display Network, as well as advertisers who have not yet used the GDN.
. Instant Previews provides a graphic overview of a search result and highlights the most relevant sections, making finding the right page as quick and easy as flipping through a magazine. Now, we’re bringing the same benefit to ads with Instant Previews for Ads. Starting today, the Instant Previews icon will appear next to ads on Google.com allowing users to preview the ad’s landing page. With Instant Previews, your customers are able to quickly preview a page to see if its content matches what they’re searching for. By allowing potential customers to preview your site before they arrive, Instant Previews helps you get even more highly-qualified traffic to your site. Even better, Instant Preview clicks are free of charge -- you’re only charged if a user clicks through to your actual landing page. Instant Previews for Ads is rolling out to US users today and will be rolling out internationally over the coming weeks. To learn more, you can visit our help center. In November of last year we took Instant to a new level on Google.com with Instant Previews. Instant Previews provides a graphic overview of a search result and highlights the most relevant sections, making finding the right page as quick and easy as flipping through a magazine. is a site where you can explore new AdWords marketing technologies. You can watch demos, try the latest tools, and share your feedback with our teams. We’re posting today to announce that Ad Innovations is now live in six new countries: the United Kingdom, Germany, Spain, France, Italy, and Brazil. And for those of you in the US, you’ll notice that Ad Innovations has a new look! We’ll be rolling out this updated design to all Ad Innovations sites in the next few months. Whether you’re most interested in search, display, mobile, or performance measurement, we hope you’ll be able to find a number of AdWords features to help you stay on top of the newest advertising developments. Head to your local site and see which innovations are available in your market. Ad Innovations is a site where you can explore new AdWords marketing technologies. You can watch demos, try the latest tools, and share your feedback with our teams. We’re posting today to announce that Ad Innovations is now live in six new countries: the United Kingdom, Germany, Spain, France, Italy, and Brazil. Many advertisers are concerned about the average position of their ads. Though this metric can be useful, it's easy to misinterpret. This blog post is intended to help advertisers better understand the average position metric, its uses, and its limitations. To begin with, it's important to understand that there are two interpretations of the phrase “ad position.” The “page position” refers to the location on the page, such as “top ad 2” or “right-hand side ad 1.” The “auction position” is the rank of the ad in the auction that determines the order of the ads on the page. The critical point is that the reported average position metric is based on auction position, not page position. 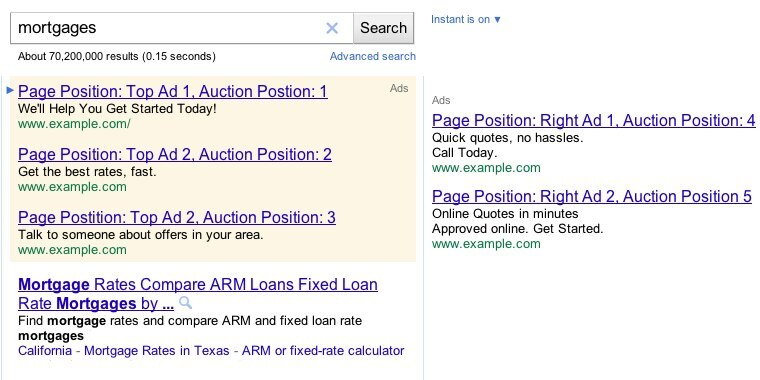 This means that an ad in auction position 1 will always be the first ad shown on the page, but it can occur in two possible page positions: as the first ad above the search results or as the first ad on the right-hand side when there are no ads above the search results. This distinction is important, since, on average, ads that appear above the search results tend to get substantially more clicks than ads that appear on the right-hand side. The difference between page and auction position can lead to some seemingly paradoxical outcomes. If you bid on a keyword that many other advertisers are bidding on, you may end up in a relatively low position on the page due to the competition from other bidders. However, the very fact that many people are bidding on that keyword suggests that it will perform well, even when your ad is placed lower on the page. On the other hand, if you bid on a keyword that no one else is bidding on, you may end up in position 1 by default but end up with few clicks. What matters is how the keyword performs in terms of clicks and cost, not where it ends up on the page. Suppose your ad always appears in position 1 on the right-hand side, and there are no “top ads” above the search results. You now increase your bid. If your ad quality is high enough, the bid increase can move it to a page position above the search results. This improved page position will typically produce more clicks, but there will be no change in the average position metric, since the ad’s auction position hasn’t changed: it's 1 in each case. When you increase your bid, your ad will generally show up on the first page in more auctions, particularly when using broad match. Since you weren’t bidding enough to appear in those auctions originally, your ad will tend to come in at the bottom of the first page in those new auctions. For example, think of a situation where you're bidding on vegan dog food (broad match), and your ad consistently appears at auction position 1 when the user enters vegan dog food, but your bid is too low for the ad to show (on the first page) when the user enters dog food. Now you increase your bid and start showing up in auction position 7 for dog food queries. If there are the same number of queries for dog food and vegan dog food, your average position will be (1+7)/2 = 4. So by increasing your bid, you've moved your average position metric from 1 to 4—even though your ad never appeared in position 4! The seemingly paradoxical effect described in the last example can even appear with exact match, since differences in bids and budgets among advertisers lead to considerable variation in auction participation. You should think about “position” as being a distribution of outcomes—sometimes you're in one position, sometimes another. The “average position” is one way to summarize this distribution, but it isn’t necessarily the best way. It's important to keep in mind that average position measures your position in the auction, not your position on the page. One very helpful tool for examining the relationship among these metrics is Bid Simulator. The Bid Simulator shows you an estimate of the "click-cost curve"—a simulation based on historical data of how much you would have had to bid, and how much it could have cost, to acquire some target number of clicks in the previous week. If you combine the click-cost curve with your value of clicks, you can find a bid that maximizes your overall profit. It also shows you an estimate of the number of top and RHS impressions an ad could have received, a metric that tends to be more meaningful for measuring ad exposure than average position. Some advertisers have asked how clicks from different positions tend to convert. In general, we've found that conversion rates don’t vary much with the position of the ad on the page. An ad in a more prominent position on the page will tend to get both more clicks and more conversions than an ad in a lower position, but the conversion rate (conversions/clicks) will tend to be about the same for the two positions. With your text ads on our brand new fleet of gBlimps, you can reach an even wider audience and capitalize on many new targeting options, including blimp height and location. You can even target special events like football games, outdoor concerts, meteor showers, and more. The possibilities are endless! Over the past few months, we’ve privately tested Blimp Ads and found that they performed even better than expected. Now you have the opportunity to boost your ad performance by participating in our free public beta testing program. Check out our product site to learn more and sign up now. Join us as we continue to push the boundaries of advertising. For more than ten years, AdWords has been at the forefront of the advertising world. From text ads to video ads, we’ve been constantly innovating and redefining the advertising ecosystem. Starting today, you can be one of the first to experience the next generation of advertising: Google Blimp Ads. Imagine this: a baseball stadium, packed with thousands of fans. A home run flies through the air, and as the crowd looks up, they see your ad, bigger than ever, hand-painted on the side of a majestic blimp. Blimp Ads can make this a reality.